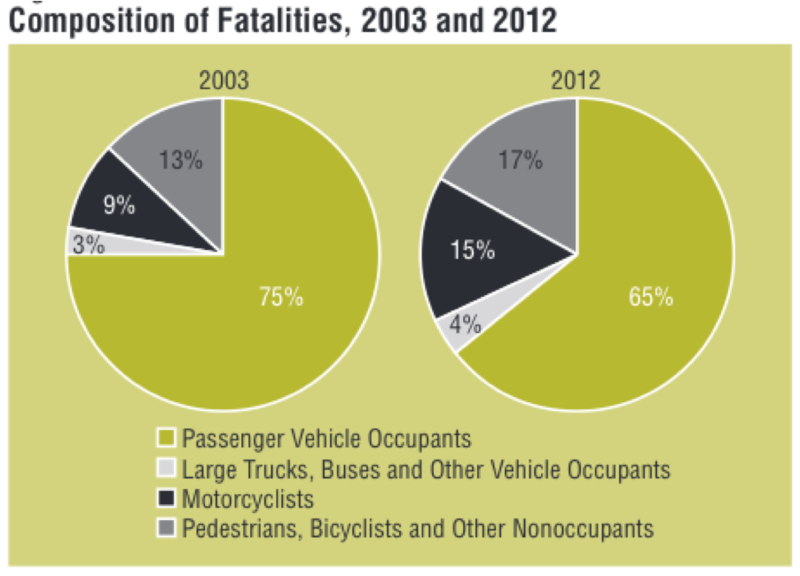 How does this data relate to the overall number of bicyclists riding in 2011 and 2012? For instance your previous census of bike commuters in September showed a 9% increase in bike commuting from 2011 to 2012, which didn’t even account for part time bike commuters, or recreational which would have raised that number even higher. Other data I have seen shows an overall increase in people biking. If the numbers are similar and there has been a 9-10% increase in people biking, and fatalities rose 6.5% and injuries 2.1% wouldn’t that indicate that things are actually modestly safer for cyclists from 2011 to 2012 given a higher base number of cyclists in ratio to fatalities and injuries? I suspect part of the change in the pie chart is because cars are getting ever safer for their occupants, thanks to technical advances. But pedestrians and cyclists hit by cars and trucks have no such luck. BTW, what’s up with the “pedalcyclist” retronym used in the report? Sounds like something only a bureaucrat could dream up. Imagine if there was a news report: “33,000 Americans killed in plane crashes.” Or “33,000 Americans killed by terrorists.” The media would be all over it. But 33,000 deaths by automobile? Apparently, this is an acceptable number of deaths on our roads – and no one will make a peep. Shameful. This matches, almost exactly, the total battle deaths suffered by the U.S. military during the Korean War. According to Wikipedia, that total for the war, which lasted from 1950-53, was 33,686. There is indication in reports I have surveyed that as cars get safer the operators tend to drive in an otherwise more risky fashion (and then of course there is the growing use of cell phones, etc). These behaviors put non-occupants (pedestrians, bicyclists, motorcyclists) at greater risk. Driver education. Here in the States we hand out driving permits too easily. Most motorists have poor driving skills but most motorists think they are above average drivers. We need to teach people how to drive and the manufacturers need to foot the bill. “pedalcyclist” dates from the 70s, I think. “Cyclist” can be confused with somebody who rides a motorcycle, while the overly pedantic (who abound in bureaucracy) note that “bicyclist” refers only to people who ride bicycles, which excludes anything that doesn’t have exactly two wheels. And I suspect you are correct in your assessment that increased safety for car occupants reduces traffic fatalities for them while doing nothing to decrease actual crash risk. There’s no doubt that the decrease in occupant deaths is mostly due to airbags, crumple zones, and other new auto tech. Automotive engineers have done a great job in this aspect. We need similar effort applied towards protecting people outside of vehicles. That probably means street and road design improvements to decrease the likelihood of a car coming in contact with a pedestrian or cyclist. Or at least slowing down the speed of impact. Also, I believe that the features that make a car safer if it rolls over make it more difficult to see out the back window. I’m reminded of the taunt: “Where did you get your license? In a box of corn flakes?” Even though cars are much heavier and faster now, our driver licensing standards seem to be stuck back in the Model T Ford era. Requiring drivers to take a behind the wheel test every ten years (every five for us older folks) might help. I would also advocate higher standards for people who want to operate larger vehicles and high performance cars. In the world of motorhomes anyone with a common license can legally drive one that’s up to 40 feet or 13 tons. Considering some of the folks we’ve met at RV parks, this can be rather scary. Here in Southern California, we’ve had several cases of someone with “more money than brains” wrapping a Porsche, Maserati or similar car around a tree or pole because in a logical world they wouldn’t be driving anything speedier than a strictly-stock Honda Civic. So to the extent that walking and biking are increasing, we should expect them to increase both in absolute number of fatalities and in percentage of fatalities. But notice that walking and biking actually are becoming *safer* in this model – originally, 9% of non-motorists were involved in a collision, while afterwards only 8% were. Now obviously this model is extremely over-simplified. But it suggests that we need to dig a bit deeper than the total numbers before we jump to the conclusion that walking and biking are getting more dangerous. their eyes so their bikes could occupy the same space. First, you can’t make overreaching statements based on one year variance of long-term continue variables and try to extract any conclusion. The overall trend over last 20 years is an absolute reduction on the count of road-traffic related deaths. I find it manipulative to analyse the percent distribution of victims and make conclusions like pedestrians been less safer than they were 10 years ago without accompanying absolute numbers that allow us to see whether pedestrians are, as a lone group, more exposed to risk or whether they just had their safety improved less than occupants of cars. There is an array of new technology being rolled out. Pedestrain/animal detectors and automated braking are already being rolled out, first on high-end vehicles and then I’m sure throughout the fleet. Crash avoidance systems are becoming smarter, and they will drastically reduce the most common kind of pedestrian hits. Further down the pipeline, the best single innovation that can slash traffic deaths are self-driven cars (like those being tested by Google and the Mercedes ones as well). There is an information gap and a lot of resentment about the people who actively seek a place where they can live car-free and those who don’t. A person (anyone) who makes a lot of important life decisions (such as which job offers to consider or whom to marry) based on a firm desire to live without cars has a degree of personal commitment and willingness to renounce to certain comforts and convenience that they must recognize it is a niche. Otherwise, these people behave like those who “went vegan” on their diets, and then become bitter toward anyone who eats animal-origin products or dare not to make provisions for their extremely picky eating choice habits. I think many more people, particularly those whose circumstances (permanent or temporary) make driving more challenging (old age, coming back from very long work shifts etc) would consider using transit if there were good alternatives, not as a sort of extreme adhesion to any social/political/environmental ideology but out of convenience. However, these folks are usually scared when most of what they hear (or maybe read if they come to this website for instance) is not about alternatives, choice and what not, but a bitter language and a bitter language where cars are villains to be “phased out”. I also think many people do not oppose the use of transit services, but they will not go to the extremes of actively picking a place to live just if it has transit, or willing to put up with serious inconveniences of car-less live (like the inability to go out and come home after services end, except for 3 metros). It was a disingenuous analysis of the data that attempts to strike up false alarm to shore up a socialist engineering anti-auto agenda, rather than merely stating 519 less traffic related fatalities in 2012. From where I stand most of the resentment isn’t with those who don’t want to live care-free, but rather with those who decide to drive imposing the negatives of their choice on those who don’t drive. Or to use your vegan analogy, it’s equivalent to vegans being forced to see, smell, and have meat thrust right under their noses. Case in point are suburban auto commuters in cities like New York where you can largely live car-free. It basically comes down to people wanting to live in areas where they don’t have to drive, and where they don’t have to deal with anyone else driving. Unfortunately, the auto and oil lobbies have prevented such areas from existing even though making a place like NYC, or at least Manhattan, free of private autos/taxis would certainly be quite feasible. Another problem besides the suburban auto commuters are a small but vocal group of city residents who drive everywhere. If this group is so attached to cars and driving, there are plenty of places in the US which would welcome them with open arms, while there is no shortage of people willing to take their place in NYC. The hard fact is the number of places where one can live reasonably well without driving in the US is at present quite limited. I don’t think it’s too much to ask that we keep these places as free of motor vehicles as possible. Granted, we need buses, delivery trucks, emergency vehicles, sanitation trucks, and construction vehicles but that’s about it. A secondary problem with large numbers of motor vehicles in places which could otherwise be largely car-free are the traffic controls needed to prevent collisions. Stop signs and traffic signals present major impediments to both cyclists and pedestrians in terms of energy/time. Neither would be needed if we only had essential motor vehicles. In the final analysis the biggest problem isn’t that those who live car-free are seeking to impose their choice on everyone else, but rather that those who drive insist on driving even in places where viable alternatives exist imposing their choice on everyone. Self-driven cars are the ultimate answer but only if there is no longer the option of being driven by a human. A mix of human-driven and self-driven cars won’t really be much safer than the present situation. What % of traffic on NYC streets (not on controlled-access highways) and avenues are cars not owned/operated by people living in the 5 boroughs? Is it really that – say – 70, 80% of traffic is from people living not in NYC proper? I’m not sure, neither can I easily found data on that. An issue is that making vast swaths of inhabited land “car free” (instead of merely car-lite, with expressways/freeways connecting places beyond them) is that it would put severe burdens on certain professions or perfectly legitimate activities. Finally, I think NYC specifically suffers from a form of resentment based on a wrong idea that it should be somehow insulated from wider American trends. There are many bitter bloggers about NYC is becoming “Americanized” in terms of chain stores in Manhattan, college students “that behave as if they were in Ohio or Florida and don’t care about the uniqueness of the city”, the assimilation of former ethnic ghettos etc. Whether the cars belong to city residents or suburban residents, the fact is in most cases these people have other options to get around in NYC. I would actually be quite happy if we allowed private cars only on expressways within city limits. That’s a reasonable compromise which allows people from outside the city to pass through to other places outside the city while not burdening local streets with hordes of private automobiles. Logistically to implement this we would need highway connections to all the crossings into or out of NYC but I’m sure it could be done. NYC historically has been different from the rest of America, so the resentment you notice should come as no surprise. When I went to college in Princeton, NJ in 1980 to me it was like entering a foreign country. NYC is unique and I see nothing wrong with trying to keep it that way. I don’t long for the days of high crime but I think a lot has been lost now that artists and other unique types can’t afford to live here. Somehow investment bankers and chain stores don’t do much to make a place interesting. People need to stop driving. Period. Buy a bicycle SAVE THE WORLD! Cars don’t belong anywhere. They’re a menace to society. @disqus_dlP91vGbzC:disqus, your argument of the uniqueness of New York is very analogue to those trying to justify, in the 1960s, racial legal segregation (of employment, shopping, leisure) as something unique to Southern US on the infamous “separate but equal” line of arguments. NYC is no place detached from the rest of US, the more indistinguishable it is from the rest of the country, the better. Instead of slamming cyclists, have you tried educating them? It’s hard not to sound pompous and snide when explaining to bicyclists that riding on the sidewalk is extremely dangerous for them, or that riding against traffic is a bad idea (physics dictates this, alone!). Many cyclists are completely unaware of the statistics and facts showing that bikes are safer in the road than on sidewalks. It is a learned security to ride in the street with traffic – most people would agree that riding in the road seems scary and unsafe. This bicycle-driver war needs to end. We are all PEOPLE. We need to stop worrying about who is breaking laws, and focus on how to help drivers and cyclists become more safe. What burdens? When I was in The Netherlands, there were exactly zero people that I saw that were “burdened” by car-light or car-free urban zones. Cycling up 60%, injuries up 2.1% and deaths 6.5%. Isn’t that the safety in numbers everyone wanted? I’m afraid that train left the station long ago. A recent news item mentioned the 100th anniversary of Henry Ford’s first assembly line, and for those who consider the motorcar one of “history’s worst inventions” it was all downhill after that. Until you need an ambulance then driving becomes ok I guess. Who needs a war , just keep driving! “Or 33,000 by train.” The lamestream media fell over themselves to report the HSR crash in China. Since when is it the driver of an automobile’s job to educate a cyclist on driving laws? It should be a law that anyone who wants to drive a bicycle on roads that have automobiles should be licensed and have insurance and pass a test just as we who drive cars do and be law enforcement’s job. It seems you took that only completely out of context. Hooray for yu. Emissions could be cut, fossil fuel saved, people could be exercised. Sounds like a good deal. Amazing, traffic deaths in sheer numbers are down by 23,000 roughly since the early 1970s even though driven mileage has greatly increased since then and now what appears to some of us to be a great deal of progress toward safety is seen by others as a crisis. The same thing is true of the trucking industry, which has reduced the key fatalities per million (or billion) miles operated by the industry by 80% since 1979, and yet others claim that there has been virtually no improvement in actual fatality numbers since 1979 too, even though there are 2.5 times as many heavy trucks on the highway today as there were in 1979, running double the mileage that the industry ran in 1979 too. So you want to go back to streetcars? How would going back to streetcars in urban design reduce transportation rates? Did you know that on a per-mile basis that urban streetcars of the 1920s suffered a fatality rate a dozen times as bad as the auto fatality rate today? Anytime that we move the human body faster than a walking speed there are bound to be occasional accidents that cause injuries and fatalities. Even the bicycle crowd has a fairly high accident, injury, and fatality rate, along with a nearly 40% rate of fatal bike accidents caused by intoxicated riding too. However, Mothers Against Drunk Bicyclists just doesn’t have the same ring. No, since both auto drivers and semi drivers are harsh judged if fatality and injury numbers don’t rapidly decline when the sheer number of cars and trucks substantially rise why would the bicycle rider crowd feel that they should get special recognition for an increasing number of fatalities and injuries no matter how many people ride bicycles? Car and truck drivers are educated generally by paying for enough training to pass a State licensing exam, which would work great for bicyclists except no bicyclist is required to have a rider’s license to operate on public roads. Nor are bicycle riders required to have license plates so that scofflaws can be easily identified, nor are bicycle riders required to have insurance like other highway users, nor are bicycle riders required to signal their turn intentions nor use operating brake lights on their bikes like every other road user is required by-law to do either. This isn’t a war against bicycle riders and never was. This is a war against common adult bicycle-riding practices that the vast majority of the driving public feels are unsafe and should be illegal, as the same behavior or lack of legal equipment would be illegal and ticketable if any other roadway user did it and got caught. Why do so many adult bicycle riders feel that riding a bicycle on public roads gives them as a group some sort of blanket exemption against having to follow common traffic and safety equipment laws, that is what I would like to know? Actually, cars on-average are a good deal lighter now than they were just 40 years ago. You want to know what my 1972 Sedan de Ville that I owned in 1982-83 weighed? It weighed 6,500 lbs and had a 472 V-8, whereas my Jeep Grand Cherokee today only weighs 3,500 lbs and it has a 3.6-liter V-6, an engine about half the displacement size of the engine in my 1972 Cadillac. My 1964 Buick Riviera that I owned from 1976-1978 weighed over 5,000 lbs and it had a 425 V-8 too. Even the average car in the 1940s and 1950s was much heavier than today’s cars too. California does have a graduated driver’s license whereby only high-class drivers can legally drive on the freeway, however, note that I said “legally drive”, as plenty of car drivers drive illegally just as plenty of bicycle riders do too. Imagine if there was a news report that said 58,000 Americans killed in car crashes last year? Actually, there was such a report made back in the 1970s when America only had half the number of cars on the road that we have today. Which is why most of us my age (58) feel that having ONLY 33,000 of us killed in a single year is a vast improvement over having 58,000 of us killed in a single year instead. Good point–I was thinking of today’s cars in comparison to the Model T. One of the T-bone’s virtues was its light but sturdy construction, making it less likely to bog down in the mud, and being easier for a team of horses or mules to pull it out of a hole. Ford is making a big deal out of their new aluminum-body pickup trucks, while Chevy tells everyone about their all-steel construction. So do you honestly believe that in a city like New York that suburban commuters should be forced to ride public transit or ride a bicycle if they want to work, attend sporting events or shows, or even eat at a restaurant in the city, because it is an attitude like that which will see more and more suburbanites choose to spend their disposable income anywhere but in the city. Do remember that at-present that between 80 and 90% of all urban Americans must drive or carpool to their jobs, or waste double to triple the time riding public transit to their jobs, and that public transit in many cities suffers from a violent crime rate far higher than does driving or carpooling to and from work too. Why do much hatred for the 80-90% of Americans who must drive and/or prefer to drive, people who do not want to be forced to live car-less lifestyles, and why not go after the real reason that American cars only get half the gas mileage of foreign cars, which would be both auto and oil companies in the US that have repeatedly bought-up high-mileage technology and/or intensely lobbied Congress to keep US fuel economy standards as low as possible too? If you like life in Europe so much what not just move there? America is not Europe, we are much different. Henry Ford’s first assembly line started in 1908 and by 1910 was drowning in demand that it couldn’t keep up with, so Henry built his Highland Park plant which opened in 1912, which originally had a dozen times the capacity of his original Piquette Ave plant, and by 1915 even the Highland Park plant couldn’t keep up with the demand either. Ford’s next plant was their River Rouge plant, which in World War II employed 60,000 workers, while Ford also enlarged their Highland Park plant too. Los Angeles city planners wanted to outlaw street parking in their downtown area in 1919 because the combination of parked cars, cars and trucks being driven, bicyclists, and pedestrians trying to cross streets during rush hours was delaying streetcars trying to enter and leave the downtown terminal by up to an hour each way. That is how old this issue is, and LA downtown businesses won the day back in 1919 afraid that they would lose too much business if street parking was banned. Look at Greater Los Angeles now, almost as large as NYC population-wise, almost as large as the State of Rhode Island in land area, and growing at a far more-rapid pace than either NYC or the State of Rhode Island too. Maybe there is something good to be said for the automobile in-relation to urban growth after all? Have you noticed that since 15 years ago that the average age of bicycle fatalities is getting older and older, as now males in their mid-30s to mid-50s are the demographic with the highest fatality rate? Perhaps guys that age should figure-out a safer way to get to and from where they need to go as riding a bicycle at that age results in a much greater fatality rate than doing so between the age of 18 and 34, even though younger adults would be prone to taking greater chances with safety and lead in bicycle-riding injuries too. My dad had a 1971 Mercury Monterrey that had both driver and front passenger air-bags as well as automatic braking technology too, and the main reason that it has taken so long to get both air bags and automatic braking on cars is that vehicle manufacturers have fought the extra cost tooth and nail since the 1970s, despite ample evidence that having both on cars would substantially reduce the fatality rate too. So blame lobbying and Congress rather than the average car driver. I thought I was pretty clear on the matter. If driving is so important to a person they can live, play, and work virtually anywhere in the US besides large cities. That’s not a serious limitation. If you want to enjoy urban venues for whatever reason, I don’t think it’s too much to ask people to leave their cars in the suburbs. A place like NYC has loads of other ways to get in. Remember there is no need to take public transit all the way. Drive to a train station fairly close to the city, say 20 miles away in suburban NJ or LI, park your car, and ride the rest of the way in by train. Honestly, given traffic levels, that’s often faster than driving all the way in anyhow. It’s a fact that a minority driving in urban areas impose HUGE problems on everyone else, problems which they don’t even come remotely close to paying for. Why you seem to think that’s OK is beyond me. I submit if suburbanites decided to opt not to go to NYC if they couldn’t drive there, the city might be better off. We’ll still get plenty of people willing to come. The small amount of tax income lost would be far less than the costs to NYC dealing with the negative externalities of people driving in. In other words, NYC gains when people choose not to drive in. Also, suppose you lived in a small suburban town and hordes of NYC residents decided to drive into your town and park there? Would you like it? Would you put up with it? My guess is probably not. So why is it OK when suburbanites do exactly that in NYC? It’s a double standard. …..why not go after the real reason that American cars only get half the gas mileage of foreign cars, which would be both auto and oil companies in the US that have repeatedly bought-up high-mileage technology and/or intensely lobbied Congress to keep US fuel economy standards as low as possible too? 2 or 3-ton, huge, gas-powered behemoths carrying a few people don’t belong in cities, period. Make vehicles which make sense in urban areas and I’ll have a lot fewer problems with them. Small, electric-powered, and capable of accelerating no faster than a city bus are what we should allow. And capped to the 25 mph speed limit by GPS, at least when they’re not running on expressways. That was then, this is now. Back in 1919 cars were still far from ubiquitous. And through the 1950s at least we weren’t aware of the severe negative effects large numbers of them in urban areas would cause. When cities started choking on their own traffic, both figuratively and literally, we realized something needed to be done. Unfortunately, because of institutional inertia the movement has taken a long time to take hold. Adding to the problem is tons of built infrastructure where public transit is all but infeasible. A good start though is to limit car use in the places where we can do so without seriously affecting the majority. That would be mostly in urban areas. Down the road we can densify the inner suburbs and just abandon the exurbs. That would make car use unnecessary everywhere other than rural farming states. Note that NYC’s growth is currently limited not due to lack of transportation options, but rather because of severe lack of affordable housing. If you cold magically add 10 million units of housing costing under $1,000 per month they would fill up overnight with people who would gladly go carless. Also, the headline of this article speaks to the fallacy of the idea of universal driving. It’s a fact some large percentage of the population, perhaps 75% to 90%, is utterly incapable of safely driving a motor vehicle regardless of the amount of training they receive. This is because they lack the spatial judgement, reflexes, intelligence, sense, or attitude to safely drive. Training can’t fix that. Add in the fact there really is no real training for drivers licenses. That’s why you have 35K killed each year, plus another few million maimed. So whatever advantages you might purport that car ownership has, the idea falls apart when you try to square in the fact most people can never be taught to drive safely. We tried ignoring this for the last 75 years. All it’s gotten us is millions dead. For some perspective the US lost about 1.35 million in all the wars it’s ever fought. We lost most people than that on our roads in the last three decades, plus maybe ten times that number to air pollution. How this is even remotely acceptable defies credulity. Or perhaps we should figure out how to make it safer for people who choose to walk or bike, regardless of their age. Remember just about 100% of bicycle fatalities are caused by collisions with motor vehicles. If you separate modes, then bicycling is nearly perfectly safe, safer than walking actually. If training and licensing worked so well for motorists we wouldn’t have 35K dead each year. Fact is licensing, insurance, registration, and even many traffic laws serve only one purpose—to line the pockets of various interest groups. As such, nothing is gained to applying these ill-thought concepts to an inherently much safer form of transportation like cycling. If we want safe transportation, a good start would be to have motor vehicles operated only by very highly trained professionals. A driver’s license should be as hard to get and keep as a pilot’s license. Longer term we should have only self-driven motor vehicles on public roads. Most of the general public has no business piloting anything heavier or faster than a bicycle. Years of statistics show they just aren’t up to the task. I’m 53 and I feel any number much higher than zero is unacceptable. There are other ways of getting around which would in fact get us quite close to that number. If nobody could drive, then those means of getting around would be a lot more ubiquitous and convenient. So it isn’t that we can’t have safe transportation. Such transportation has existed for decades. Rather, it’s that we continue to justify using what is a highly dangerous mode. Arguably, if the NTSB were in charge of our roads, they would have shut them down until a way was found to bring fatalities down to around where there are for planes or trains.